Roland Freisler studied law in Kiel. During the First World War he was imprisoned by the Russians and he learned Russian. In 1923 he returned to Berlin and he married Marion Rusegger. After the burning of the Reichstag he was given considerable powers to perscute Hitler's opponents. His bursts of anger were recorded on film and he was frequently a shame to the nazis. He presided the court that sentenced Sophie Scholl, Hans Scholl and Christopher Probst to death. After the attempt on Hitler's life in 1944 he sentenced many people to death without a shred of evidence. During a trial in Berlin the allied forces bombarded the city. Everybody had fled the courtroom to find shelter but he returned to pick up several important papers. At that moment the Palace of Justice was hit and he was killed immediately. He didn't receive a state funeral but he was buried anonymously in the grave of his wife's family in Berlin. 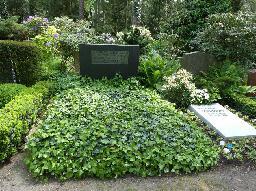 The grave of Roland Freisler at the Waldfriedhof Dahlem, Berlin.